It really is hard to be truly original. I thought that the concept of a snowflake pendant was original and a perfect gift for your woman, celebrating how unique she is. But I guess the snowflake theme has been used regularly. 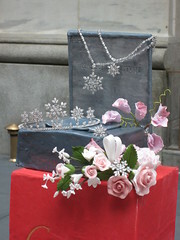 Following my post about *Ruta Fox’s version of the snowflake, I ran into another version at Knox Jewelry. “The Harry Winston Salon on Fifth Avenue was transformed to a magical Winston Wonderland to showcase the newest collection, Diamond de Neige. The event highlighted some of Winston’s most select pieces as guests were treated to a whimsical experience with nymphs, ice queens, and a soothing harpist; all adorned with an exquisite collection of diamonds. All of Harry Winston’s reflections of nature, whether it be Wreaths or Clusters, or Diamond de Neige, were there for viewing as guests experienced a truly captivating evening of enchantment. New Superman Brandon Routh (who just got engaged to Courtney Ford with a Neil Lane engagement ring), attending Harry Winston store opening in China. *Funny, while browsing the Divine Diamonds website, I noticed this quote from one of our NJ’s, James Allen: “Calmness of mind is one of the jewels of wisdom”. He must have been featured in that issue of Glamour. If someone has a copy, drop us a note. Actually the Lesotho stone Jackie Kennedy owned was a marquise… I think it was Lesotho III? The stone was 40 carats or so. The Lesotho I, linked about, is about 70.